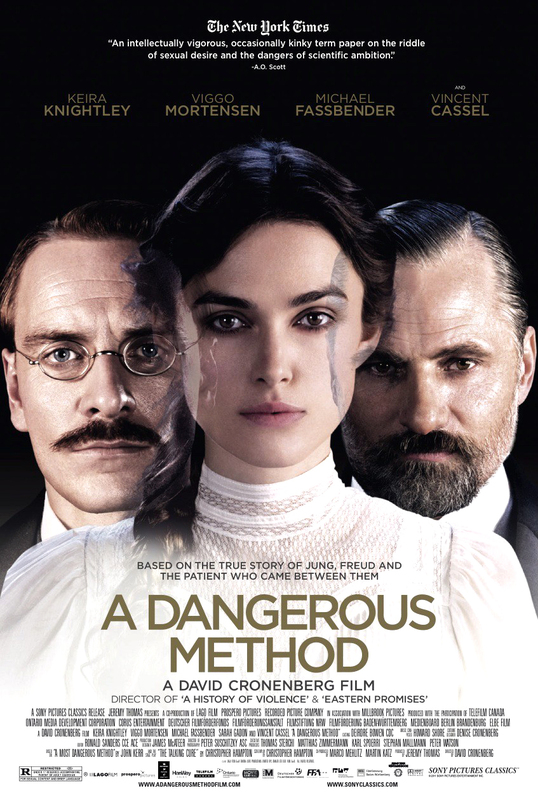 A Dangerous Method is a film directed by David Cronenberg, based on Christopher Hampton's play The Talking Cure, and John Kerr's non-fiction book A Most Dangerous Method. 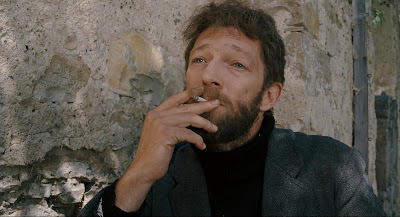 It premiered at the 2011 Venice Film Festival. 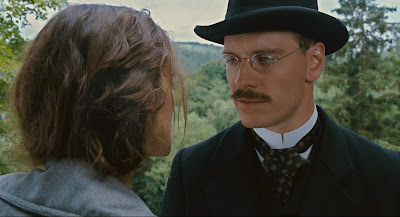 Here Cronenberg assembles a wonderful cast led by Michael Fassbender as Carl Jung, Viggo Mortensen as Sigmund Freud, Kiera Knightley as Sabina Spielrein, and Vincent Cassel as Otto Gross, to tell what essentially seems to be a tragic period romance in the guise of a historical biography. It's clearly a labor of love, as the subjects of Freud and psychoanalysis have been a long recurring theme in Cronenberg's films going as far back as 1977's Rabid; not to mention the basic idea of hidden destructive desires possessed and unleashed by accomplished medical professionals have always been his favorite film premise. It's beautifully shot, perhaps the most visually impressive thing he's ever done. With a brilliant recreation of the period aided by some glorious work from sister and long time costume designer Denise Cronenberg. 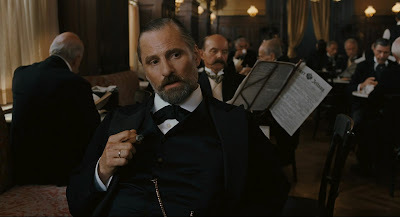 One quibble I had with the look was the painfully obvious CGI in one particular shot of Manhattan, but the other wonderful scenes shot in Germany but representing Switzerland and Austria more than make up for that small distraction. The acting is fantastic as well, as can be expected from those leads, but also from the rest of the entire ensemble, in particular from Vincent Cassel in a criminally small supporting role as Otto Gross, a sexually liberated, read perverted, rogue disciple of Freud who just might be the most fascinating character in the entire cast; and a surprisingly intense if not entirely genuine turn from Keira Knightley as Sabina Spielrein, who starts out as the first guinea pig patient of Jung's, a relationship which eventually results in a torrid affair. 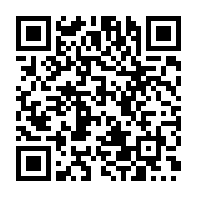 The trouble lies in the story. In attempting to cover such a long stretch of time in just over an hour and a half, the narrative suffers by being too jumpy and episodic. Although these are all deftly crafted and indisputably interesting characters, there's not nearly enough of the psychological tension, unsettling drama, or twisted darkness that we are used to seeing from a Cronenberg picture. Dare I say it lacks a certain element of danger. In the end it's a well made film and a decent watch, but doesn't quite captivate or exhilarate like one of his films should. Yeah good but not quite great. I'm already looking forward to his next one Cosmopolis. Yeah I was slightly disappointed but I will watch anything with his name on it. Those are some big names. I expect I won't be disappointed overmuch. Great review! Thanks so much. I'm dying to see this. So the film involves Freud? I will watch this one soon. good review. Really glad that you got to see this one! I liked it too, and remembered just enough from my psychology classes to enjoy the interactions and theories of each of the characters. But you're definitely right that the sense of "danger" that the title hints at never really develop. This ia a film I want to see for many reasons. 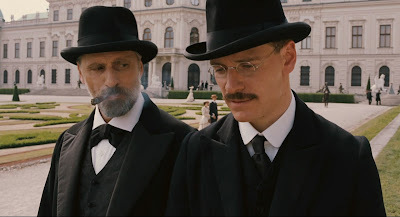 That it is a big budgeted period piece under the deft touch of David Cronenberg tops the list. The cast fills the second slot. Simply because they have so much potential with a ground breaking topic against such lavish surroundings and backdrops. I think I was oversold at the beginning, before you even got to say anything. After the trailer though, I started normalizing and then you pretty much settled it. Still definitely seeing this one, just not expecting a grand masterpiece. True... but that's because I'm not the DVD renting type. I mostly find it to difficult to rent a DVD and rush to get it back so I don't have to pay that much. 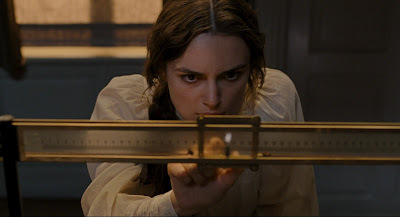 For me Knightley's work is the most embarassing and wors tperformance I've seen in years. She was in way over her head here and Cronenberg should have steered her better. I completely agree with the story being a huge problem. I found this movie to be the wost of all Cronenberg's films. Not really, but he is an interesting man. It looks pretty sober for a Cronenberg film. Since I am a fan of his work I'll dig into it with great pleasure.